Feeling bloated, heavy stomach, burping, fatigue. Until about a year ago, I had been suffering from these symptoms daily. While I had a vague idea that these might be caused by the food I was eating, I didn't know what type of food, how and why. Since "food intolerance tests are clinically invalid" - according to the mass media, I guess the only other widely accepted cure would have been medication to get rid of this problem. 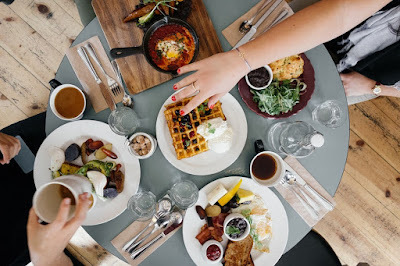 Luckily, I like to approach things naturally first, and only touch medication if it's absolutely necessary, this is my personal journey with food intolerance tests. It all goes back to around 10 years ago. I started to feel bloated, but only on certain days. It was kind of annoying as I couldn't pinpoint its cause. I tried to trace it back to the food I was eating, but I didn't get anywhere. I thought feeling bloated in the afternoon was the result of what I ate in the morning. So regardless of observing and making notes of my diet, I wasn't able to handle the problem. I went to my chiropractor, and he recommended me to do a food intolerance test. It sounded like a good idea, but I didn't do anything about it until about a year ago. That's when my wife and myself decided to get a test done. (She had her own body reactions too). Initially, we wanted to do the York test, but after some research, we chose the Fitzwilliam Food Test. (We are not affiliated with them in any way). We picked them simply because their type of test also shows the score (measure) of intolerance to certain foods, as opposed to just stating "yes or no" to what you are advised to eat and what you should avoid. I remember, just before going in for our appointment, food intolerance tests, in general, went under a massive media attack on how they are "clinically invalid" and unreliable. Well, we are "famous" about not believing everything the mass media says, so those articles didn't put us into any doubt. Anyway, we got our tests done, and the results came back after two weeks. I immediately dropped this habit, and the change was phenomenal. The morning fatigue magically disappeared! According to the test, my body reacted to so many different types of food that it was literally impossible to work out a perfect diet for. So I only started to leave out the highest scored foods (certain nuts, egg, milk). Fast-forward a year, my body really thanked me that I made these changes. I am not saying I never visit the dark side (an occasional pizza here and there, sometimes fast food), but the continuous bloating is gone, I feel a lot more energised and super light in my stomach. I know. Food intolerance tests are "clinically invalid" according to certain newspapers. But what should I do if I tried and it worked for me? I had a problem that no longer exists. I believe the best I can do is share my experience so that other people can also make their own choice and experience the relief from their symptoms, not just by covering up the symptoms, but by getting to the bottom of what's actually causing them.